Microcystin-leucine-arginine (MC-LR) is a cyclic heptapeptide hepatotoxin produced by cyanobacteria such as Microcystis aeruginosa. Being highly toxic, this compound is a threat to water quality, agriculture, and human and animal health. In particular, MC-LR has been frequently detected at high concentrations in surface waters. So far, the fate of MC-LR in soils is unknown. Here, we studied degradation and soil–plant transfer of 14C-radiolabelled MC-LR in an artificial system of agricultural soil and tomato seedlings. 14C-MC-LR was dissolved in water and applied by soil irrigation, one or two times with an interval of 28 days. 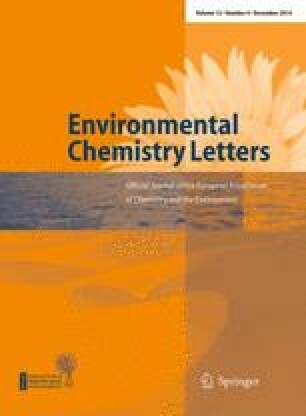 Results show that the 14CO2 from the degradation of 14C-MC-LR amounted to 11 % of total 14C initial input; 74–80 % of 14C-MC-LR occurred in extractible fractions analysed by HPLC. Less than 14 % of 14C-MC-LR was adsorbed on soil particles. Overall, our findings evidence for the first time a high risk of toxin leaching from the soil toward groundwater. Authors thank Virginie Grondin and Christelle Marrault for their help and technical assistances. They acknowledge Valérie Bergeaud (UMR EGC, Thivernal-Grignon, France) for performing soil combustions, and the Biochem-Env platform (UR 251 PESSAC) for measuring soil enzymatic activities. Biochem-Env is a service of the “Investment d’Avenir” infrastructure AnaEE-France, overseen by the French National Research Agency (ANR) (ANR-11-INBS-0001). This work is part of the “Investment d’Avenir” Programme overseen by the French National Research Agency (ANR) (LabEx BASC, ANR-11-LABX-0034). The departments PESSAC and ESE are members of the EcoBASC Network. The research was also supported by grants from Région Ile-de France to S. Corbel, DIM-ASTREA Program No ast110055.